Perfect in a pita with vegan cucumber sauce, these spicy gyro-style veggie meat slices are so good that even non-vegans will be amazed! Certified organic and GMO free. 7.05 oz. (200g) package is $5.49. From JENNIFER MARA of CHICAGO, Illinois on 10/7/2017 . these were delicious for a quick meal! From Janet Yurcik of Cleveland, Ohio on 9/21/2016 . Great product. Just heat and eat! I made these on warm Mediterranean flatbreads (lightly grilled), topped with tomatoes, cucumbers, marinated onions, and vegan tzatziki sauce. Delicious! I got about 3 gyros from this package. I love Viana products!!!! Looking at the picture I was sure the texture would be to firm for me. This is a great tasting product! 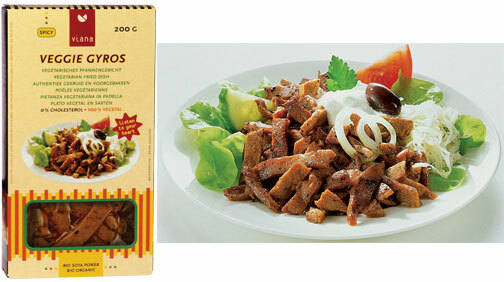 It truly makes great Gyros. it cooks up fast and easy , I suggest you only heat what you are using since it takes just as much effort to heat it the first time as it does to reheat the left overs. Second time around the texture isn't as good. Will buy it again! Maybe right now!! From nicole of macomb, Michigan on 8/6/2014 . I am obsessed with this product. I fry it and add it to a pita with tomato, red onion and homemade vegan tziki and BAM! it's a gyro. My husband gets very excited when I tell him I am making this for dinner. From Josh Dixon of Rock Hill, South Carolina on 1/13/2014 . I have tried a few Viana products and this one is my favorite by far. I love it in a pita or tortilla with lettuce, pickles, red onion and some tahini dressing. It won't fool you into thinking it's real meat, but that doesn't matter. It is spiced very well and holds up on it's own merit.